Last week I provided some examples of early work by Mort Meskin. 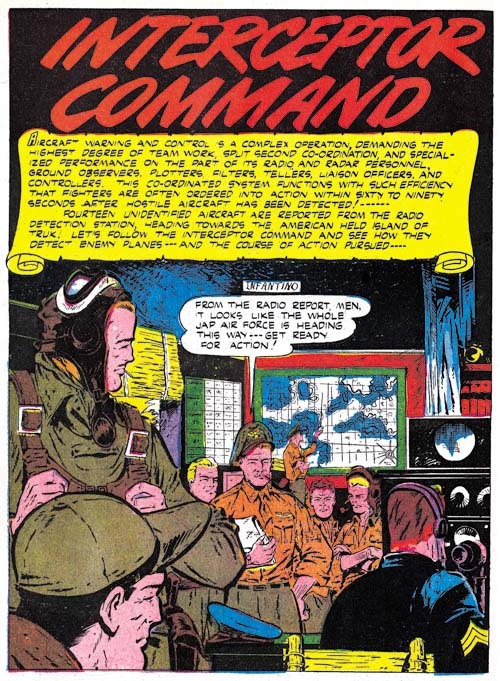 Now I would like to do the same for the period from after the war until Mort began working for Simon and Kirby. Actually I am being a little inaccurate by describing this period as post war. The war ended in Europe on May 8, 1945 and in Japan on August 15. The first issue of Golden Lad was cover dated July 1945. Because cover dates were usually advanced a couple of months from the actually released date, this issue probably hit the stands in May. Therefore the war was still ongoing when the art was created (which probably started in February). 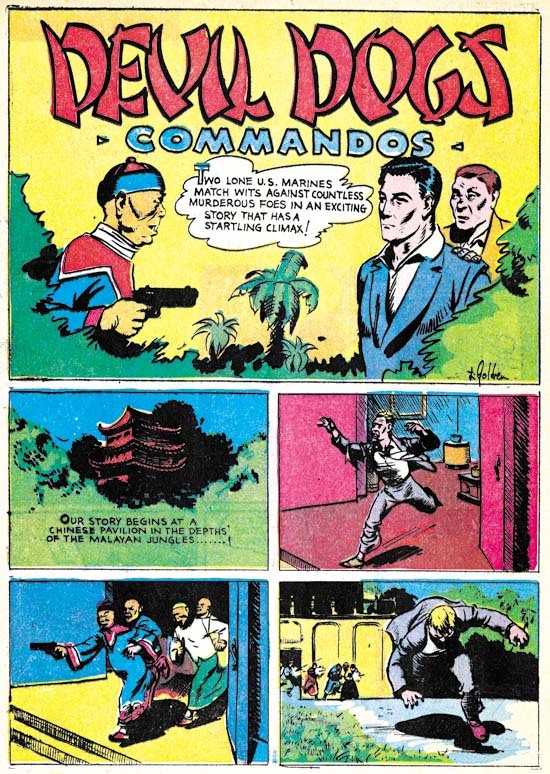 During most of the war Mort Meskin was doing work solely for National Comics. 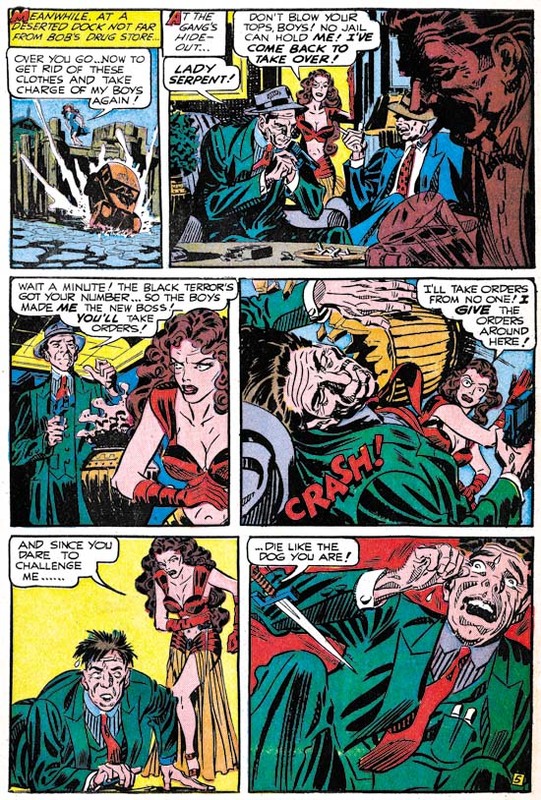 Mort would continue to provide work to DC while doing Golden Lad for Spark Publications. Maybe it is just a question of luck as to which issues are available to me, but it seems to me that there was a decline over time in the quality of Meskin’s art for DC. However that decline only affected his DC work. While the Golden Lad character may not have been that great of a creation, the art Mort provided was first rate. The splash is particularly nice. Golden Lad rises dramatically from a cauldron of molten gold. The fire provides the only light for the scene giving the surrounded conquistadors with expressive shadows. But with their modern weaponry, they are not truly conquistadors. 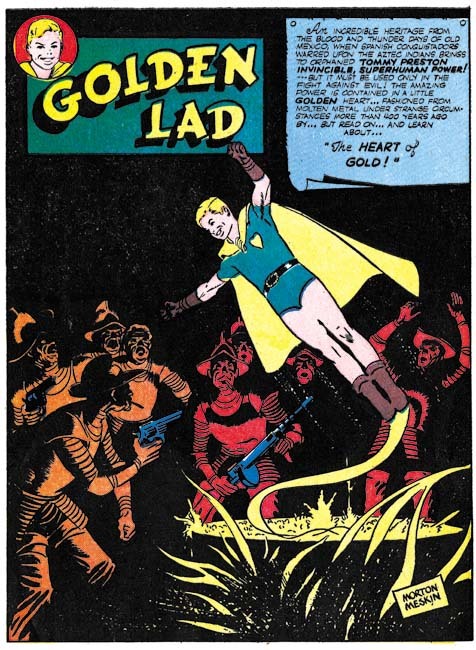 The heart of gold that provides Golden Lad with his powers was created during the time of the destruction of the Aztecs but Golden Lad fights modern criminals. The splash is a graphic amalgamation of the two concepts. I really cannot get very enthusiastic about Golden Lad himself. Like Superman, he is just too powerful to provide interesting stories. However Meskin did a good job on graphically depicting the story. 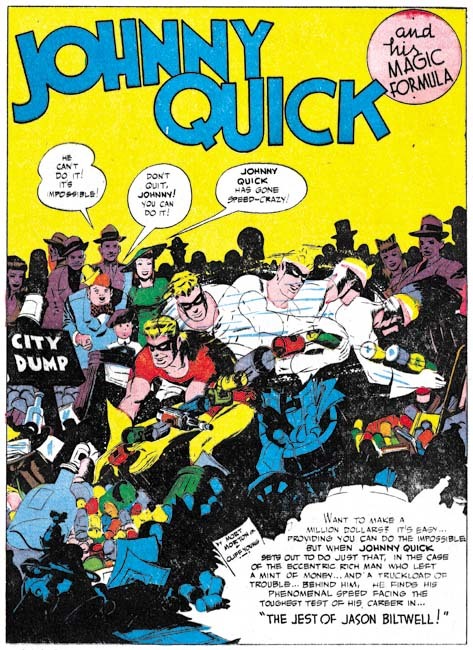 The first panel shows the use of multiple images that Mort devised in Johnny Quick for indicating super fast action. 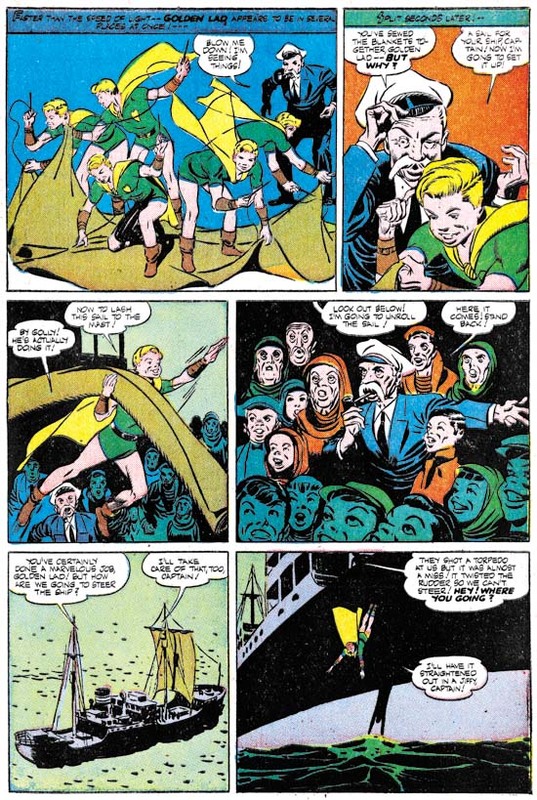 The showing the unrolling of the sail might have seem the most obvious choice for panel 5 but Meskin’s depiction of the crowd’s reaction was probably more effective. As I said before, Mort’s art for the later DC work is not as impressive as his earlier stuff. This Johnny Quick splash is probably the best of the few I have available from his later DC work. Even here I do not find the approaching alligators truly threatening. What are they going to do, gum the fisherman to death? Some of this decline in quality maybe due to the inkers being used but perhaps Meskin was loosing interest after so many years. That he did such great art for Golden Lad shows that he had not lost his talent. Meskin could do great work for DC as well, if it supplied enough of a new challenge. This scan of “How a Movie Serial Is Made” was provided by Ger Apeldoorn (Those Fabuleous Fifties). It certainly is an oddball feature. 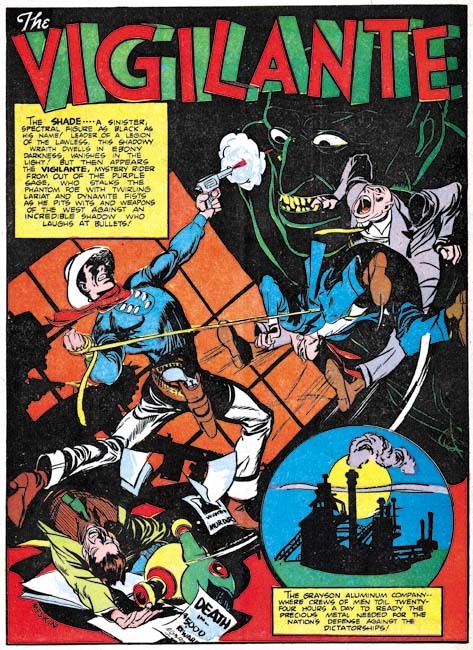 Meskin provides examples of how serial movies were created using his own character, the Vigilante. I particularly like the splash. While I am not old enough for movie serials, I do remember weekend matinees where there was a very similar response from the exclusively young audience. Mort did other work during this period besides what he did for DC and Spark. This was the time that he did a couple pieces for Prize Comics (but this was not for Simon and Kirby). I will not be discussing the Prize stories here as I covered them recently in other posts (Treasure #10 and Treasure #12). Mort Meskin would later team up with Jerry Robinson. It would therefore be informative to provide examples of Jerry’s work. Much of what Robinson did previously was on Batman working for Bob Kane. This makes it difficult to come to a clear understanding as to what Robinson’s personal style really was. The one example I can supply was for Atoman, a title from Spark Publications, the same publisher that did Golden Lad. Here Jerry does an ingenious double page splash. The best location for a double page splash was the centerfold. Place one anywhere else and the two pages would have to be printed on separate sheets of paper. With the primitive printing of comics of those days there was little likelihood that the registration would work out properly in the finished comic book. 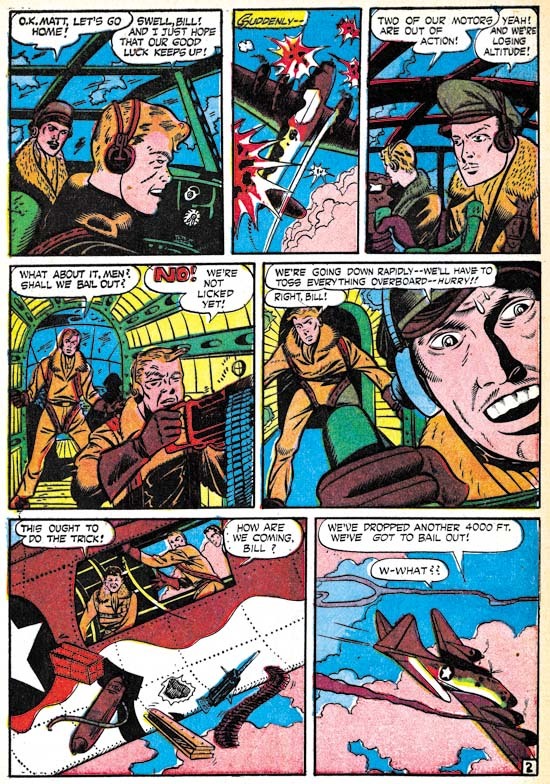 Robinson’s wide splash is at the front of the comic but he avoids the registration problem by purposely including a gutter in the design that would separate the two image halves. He has not simply bisected the image; if you were to bring the two pages together they would not line up properly. Here is an example of a story page from Atoman. But note the man in panel 5. He has to my eyes a distinctively Meskin look to him. There are a few other similar Meskin-like portrayals in the story as well. Was Mort giving Jerry a hand? Or was Robinson being influenced by Meskin and adopting some of his style? I do not have an answer but it is something to keep in mind when we examine joint efforts by Robinson and Meskin. In 1948 Meskin work for DC would be ending. Did Mort’s emotional problems have something to do with his end at DC? Or was it conflicts from working at National that provoked his emotional problems? The above splash from Western Comics #4 was among these final efforts. 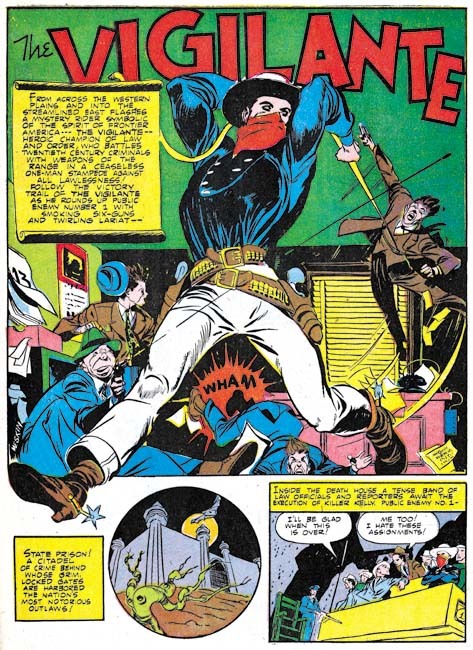 I am not sure how, but the Vigilante has somehow made the transition from a costume hero in the modern age to being a western genre hero. Robinson and Meskin were only teamed up for a relatively short time, a little over a year. I may not be clear as to exactly what each of the two artists contributed to the joint efforts, but whatever it was it certainly was very successful. I find the art as exciting as Mort’s early work for DC. It was not just the splashes that Robinson and Meskin did so well, the story art is also first rate. Note the inking on this page as particularly seen in the last panel. The long sweeping parallel lines would later play an important part of Meskin’s inking style. Even more interesting is the presence of picket fence crosshatching (see the Inking Glossary for explanations of the terms I use to describe spotting techniques). 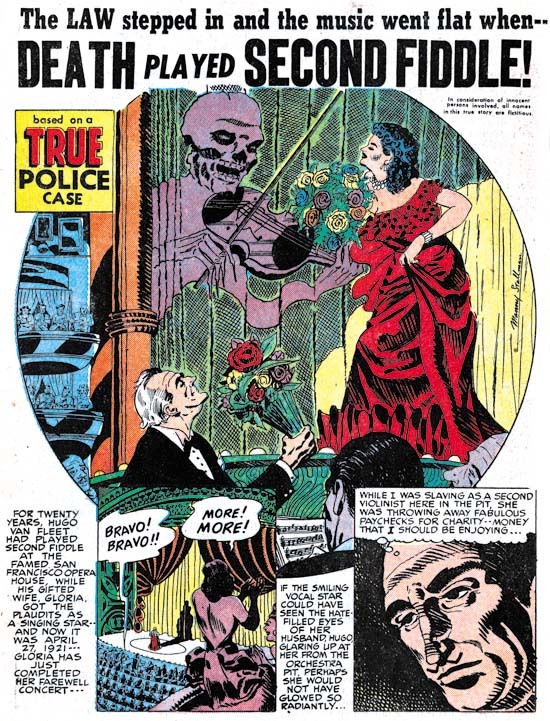 Similar inking can be found for a piece that Jerry and Mort did for Simon and Kirby (Young Romance #5, May 1948). 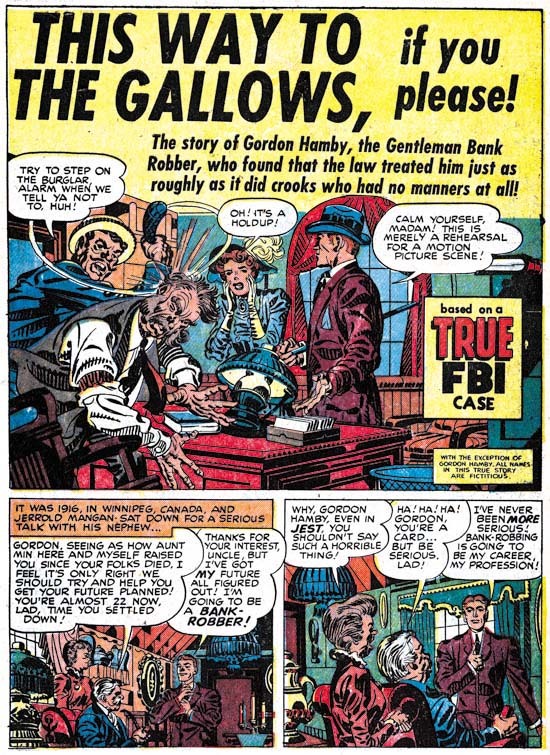 The inking looks like it was done by Meskin, but did he pick up the picket fence technique from Simon and Kirby or is there an earlier Robinson and Meskin example that I have not seen yet? Another great splash by Jerry Robinson and Mort Meskin. I might not have anything to say about it but how could I resist including it in this post? 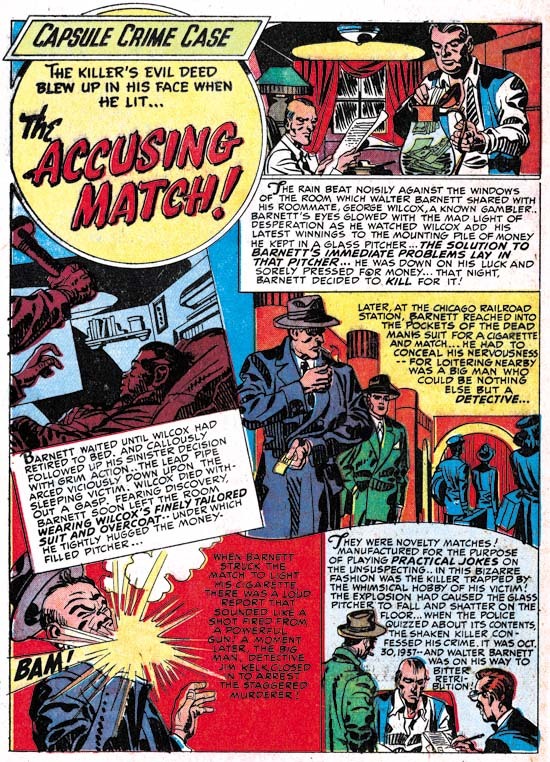 I previously used a story page from this work to show the style Mort had adopted for depicting punches. 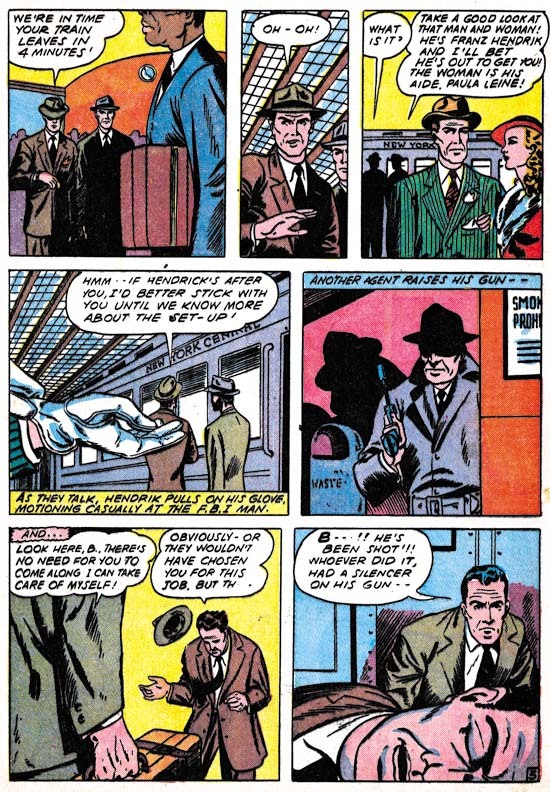 There may have been a relatively brief period between after the breakup of the Robinson and Meskin team where Mort was doing work by himself again but he had not yet started to work for Simon and Kirby. 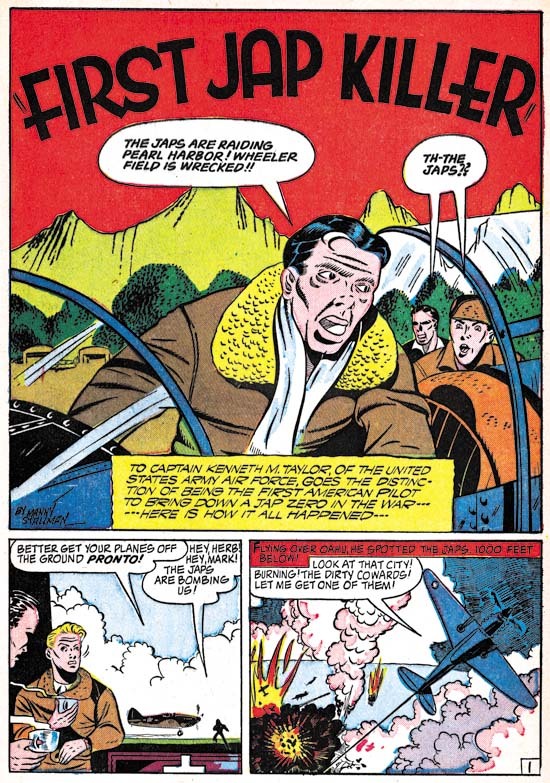 Fighting Yank #29 is signed by Meskin alone and Robinson does not appear anywhere in the comic. 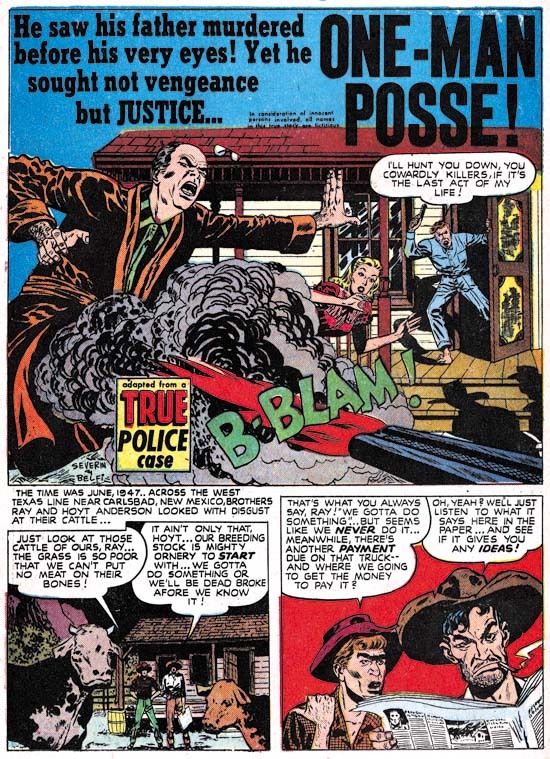 Mort’s first solo work for Simon and Kirby were cover dated December 1949 (Real West Romance #5 and Young Romance #16). 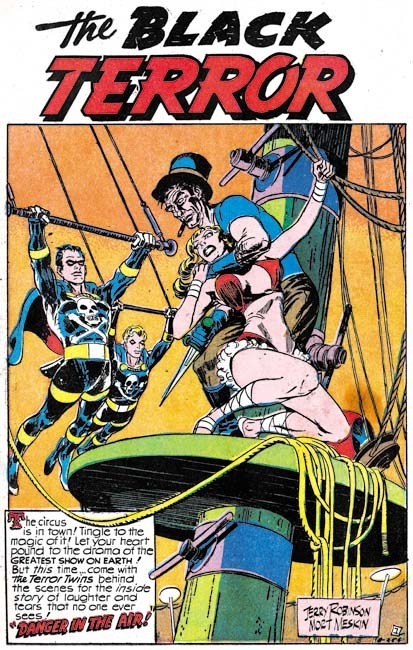 Joe Simon has reported in The Comic Book Makers that initially Mort had an artist block. That Meskin was doing some solo work before joining Simon and Kirby may indicate that the artist block did not start until he actually began working for Joe and Jack. 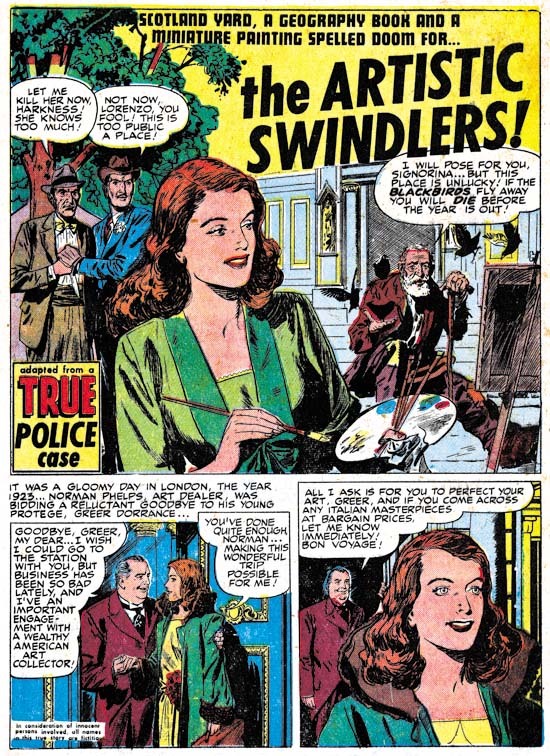 Perhaps intimidating presence of Jack Kirby had something to do with Mort’s artistic difficulties. The “Fireworks on the Fourth” is inked in an interesting spotting technique. The blacks are grouped in a blocky fashion that to my eyes seems to flatten the image while providing it with interesting patterns. This is not the result of a bad printing; other stories by Meskin in the same issue are not inked in this manner. The effects of this unusual inking can be best be seen in the story itself. While it is possible that this inking was done by another artist, I believe it was Mort’s own work. He would use a similar style of inking for a period later for some Simon and Kirby productions. 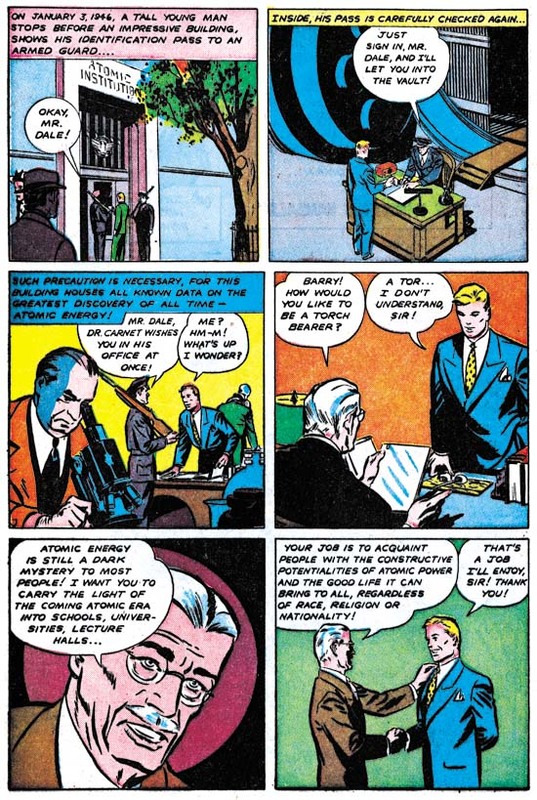 In a few months Mort Meskin would begin working for Simon and Kirby. 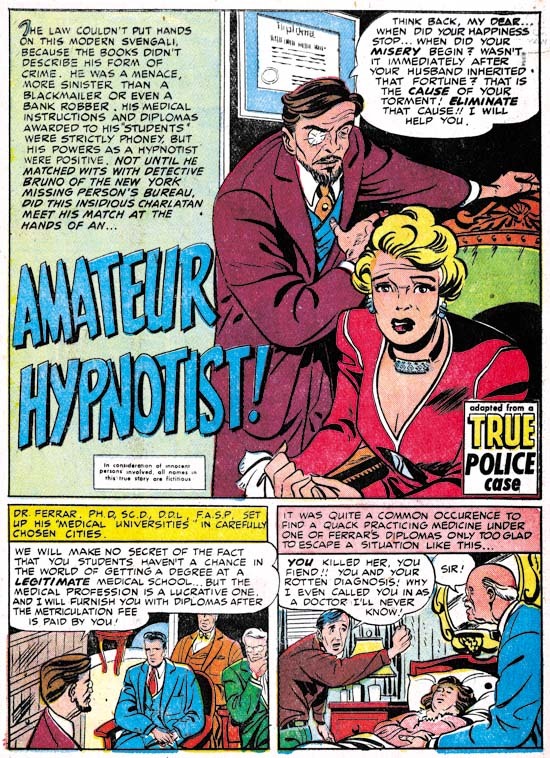 Mort would become an important and prolific artist for Simon and Kirby productions. He did not, however, work exclusively for Joe and Jack. Meskin would also provide work for other Prize comics and occasionally other publishers as well. While my main interest in Mort Meskin concerns the art that he did for the Simon and Kirby studio, he also did some great work both before and after that. I thought a brief examination of his earlier efforts might prove interesting. Unfortunately I can only provide a very unbalanced outline of Mort’s initial career as I have a very limited access to the comics that he appeared in. 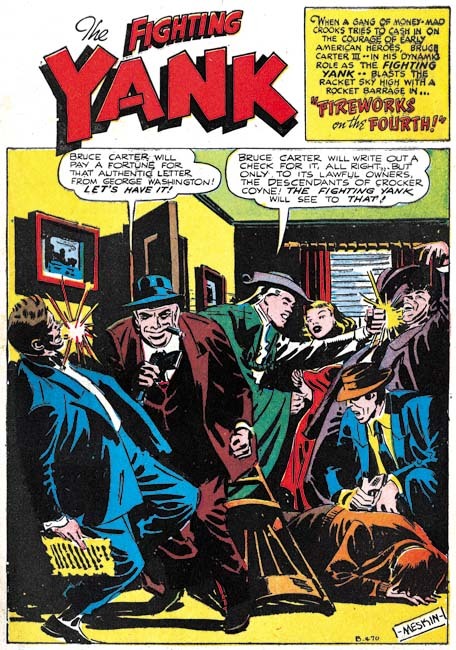 But even a flawed outline of Meskin’s early art can be useful especially since Mort Meskin has been overlooked by most of today’s comic book fans and little of his work has been reprinted. 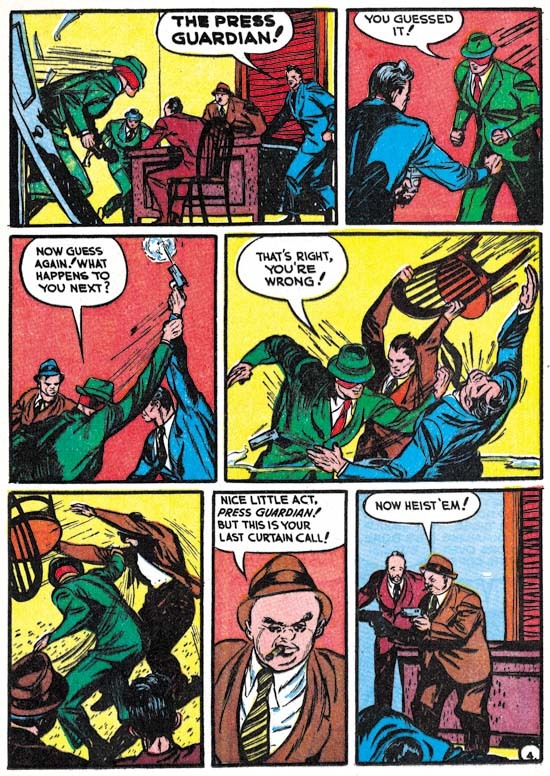 The earliest work by Meskin that I can provide comes from Pep Comics #11 (January 1941). Meskin had already been working at comic books for a couple of years so this is by no means among his earliest efforts. It is a very different Meskin found here as there are no signs of the typical traits that can be found throughout most of Mort’s career; traits such as the very distinctive grin he often provided to male characters. The vertical splash layout for the Press Guardian is one that Meskin would later use particularly when working with Jerry Robinson. However Mort’s handling of the story panels makes this layout distinctive from his later uses of the vertical splash. 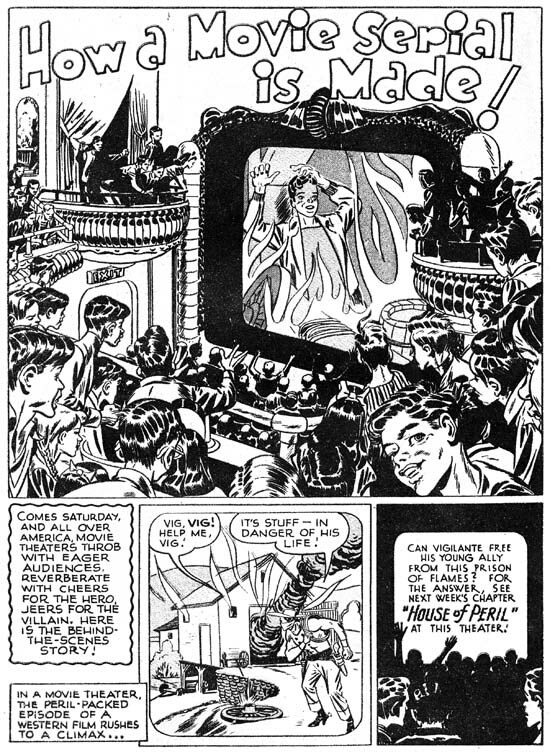 Here Meskin uses three story panels instead of the more typical two. In fact they could more properly be called three rows as there are two panels in the second row and the undivided rows now have wider panels. This arrangement gives most of the room on the page to the story panels but Mort puts what space is available for the splash to good use. It is in the story art that the difference between the very early Mort Meskin and his later efforts is most apparent. Almost the entire story is shown from distant view points where either the entire figures are shown or at least the upper half of the figures. Examples such as panel 6 from page 4 where the view gets close enough to provide facial details are the rare exceptions. True close-ups are nonexistent. The “cinematic” approach that would be so important to Meskin’s later art it not to be found in these earlier stories. Within his more limited control of view point, Meskin could still graphically tell a good story. While his figures may, at times, be a little stiff, Meskin included some nice action sequences. The Press Guardian story was signed simply as Mort. There can be no question that this was indeed Meskin because that name was signed to the “Midshipman” feature from the same issue. While the layout for the splash page is different, otherwise the art style is the same. I wish I had more of this very early Mort Meskin to show; it would be interesting to see how and when his more typical style developed. It was just ten months later from Pep Comics #11 when Mort Meskin’s first work for DC appeared. 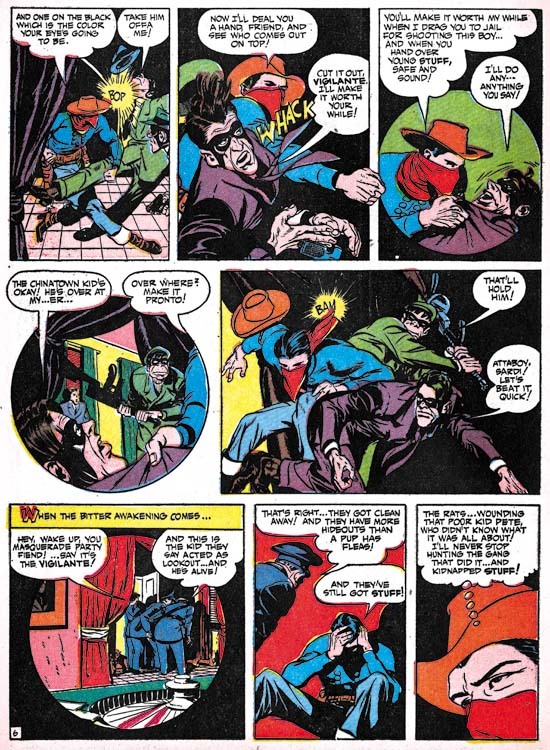 While his work in Pep #11 showed promise, Meskin’s Vigilante for Action Comics #42 was promised fulfilled. The splash was signed, but a signature really is not required to identify this work. Meskin’s unique hand can be seen all over the story. 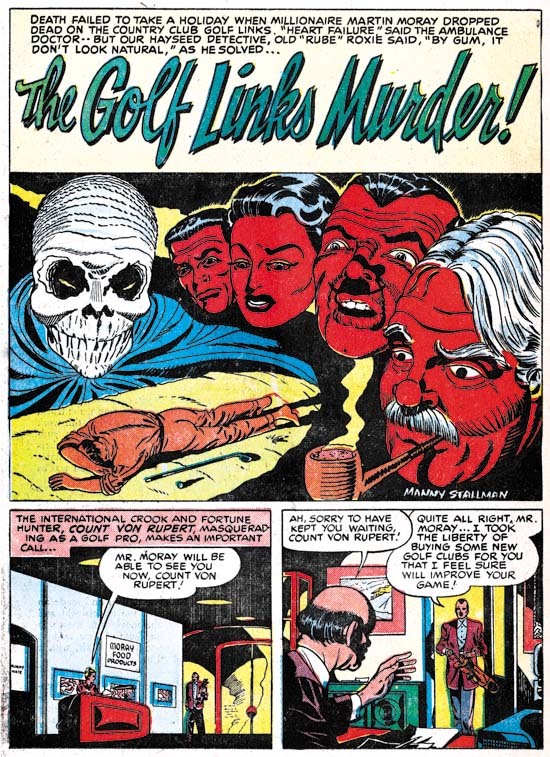 But those readers only familiar with his work for Simon and Kirby or his later efforts for DC horror comics might find this early Meskin surprising. It is full of action and exciting artwork. 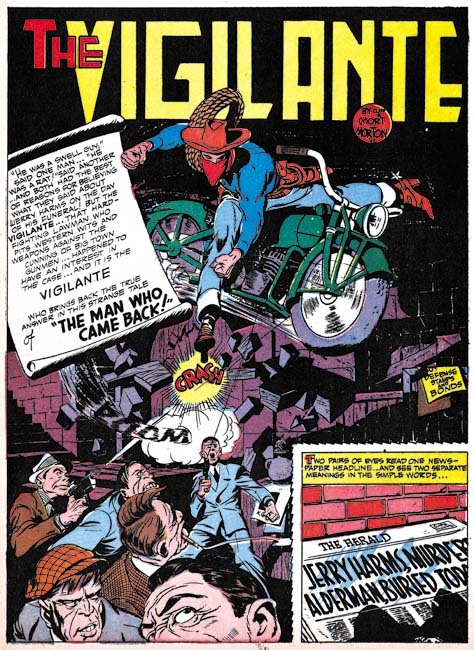 While the DC Archive volumes have included all the Superman stories from these early issues of Action Comics, few of the Vigilante stories have ever been reprinted. This is certainly not a reflection of artistic value as Meskin’s Vigilante work is greatly superior to anything else being published by DC at the time. Well that is excepting the work that Simon and Kirby were doing for DC and that has not received the archive treatment either. 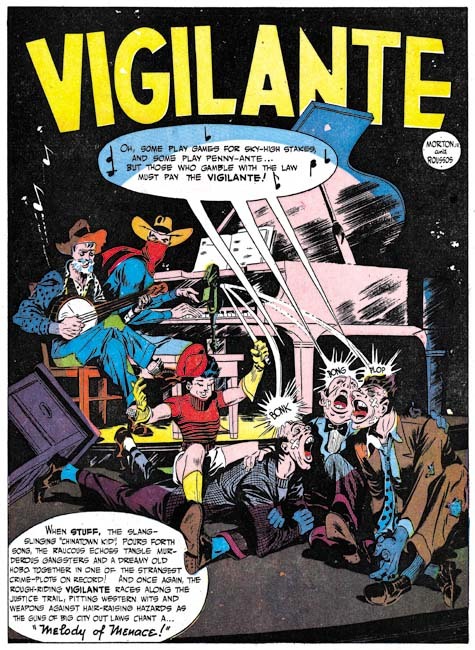 While the Vigilante’s dress might suggest that it was a western, they were contemporary stories (at least initially) and the western garb is the Vigilante’s costume. The Vigilante has no special powers; just an uncanny skill with his pistol and his rope. 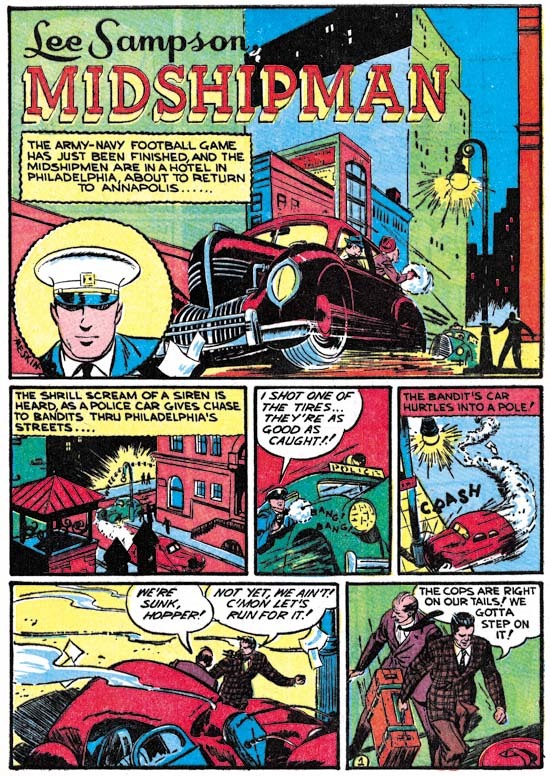 Initially the Vigilante worked alone, but he soon picked up a sidekick, Stuff the Chinatown Kid. What happened to Mort between Pep #11 and Action #42 to cause such a dramatic change in his art? I really do not have enough of his early art to say, but I would like to submit a hypothesis. It is nothing more then a guess that would need more investigation before it could even be called a theory. 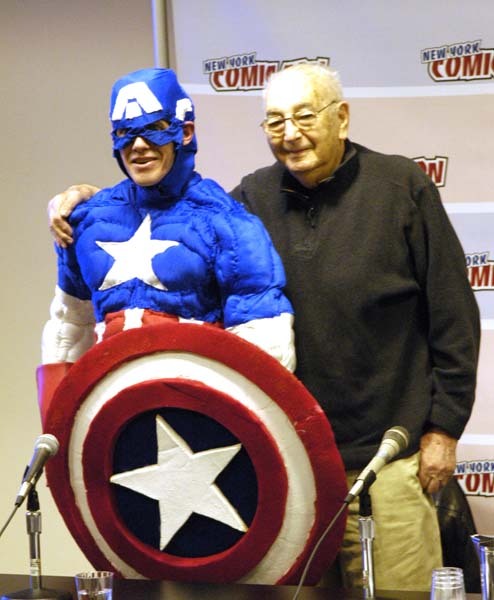 I wonder if the change that Meskin underwent was a response to the release of Simon and Kirby’s Captain America? 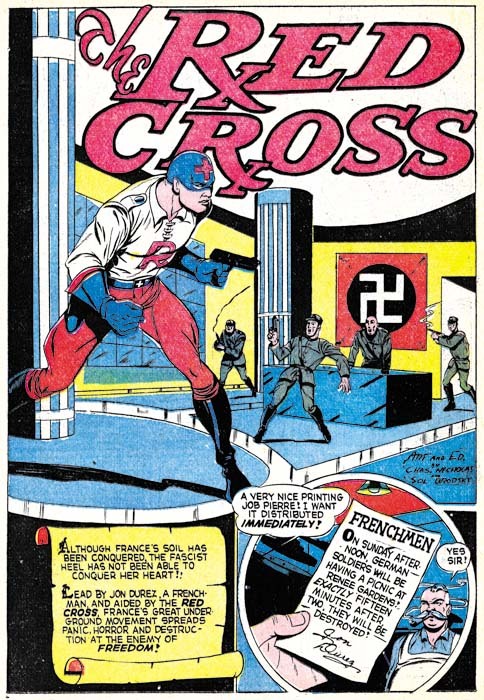 The timing is right since Captain America Comics #1 came out in March 1941. 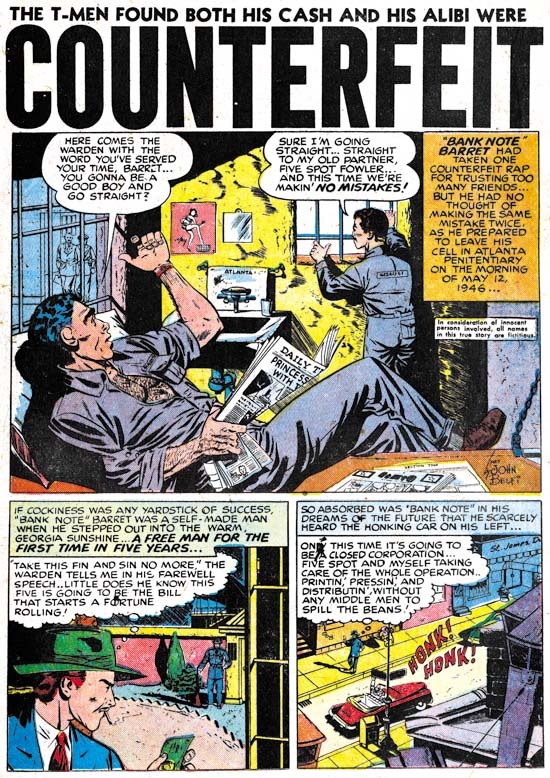 Mort’s Vigilante art uses figures extending past the panel borders, circular panels, exaggerated perspective, and dynamic slugfests all of which were favorite devices of Simon and Kirby found in Captain America. If there is any truth to this hypothesis, Meskin was not copying Kirby’s art but would instead put his own interpretations of all those techniques. 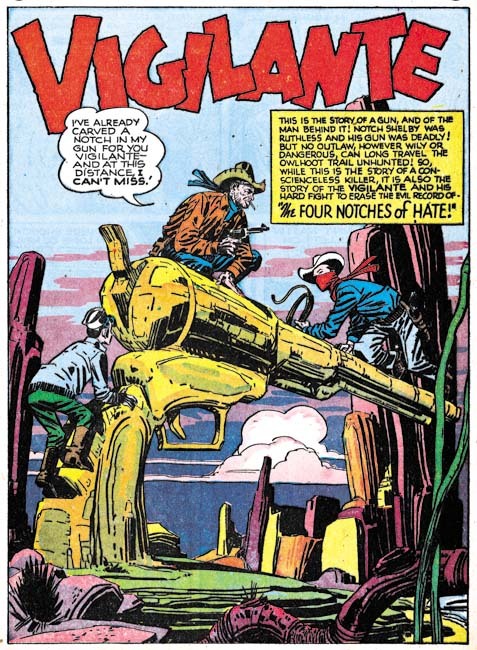 Meskin’s Vigilante splashes could be quite intricate. Here we find the Vigilante lassoing two criminals while simultaneously shooting at the image of his current nemesis, the Shade. A vanquished foe lies at his feet while shadows on the wall behind him reveal two other gun carrying opponents. There is a lot going on but Mort’s presentation is perfectly clear. The motorcycle is a clear reminder that the Vigilante is not a western, but instead belongs in the hero genre. Here part of a man’s face is clipped off by the panel’s border. This is a very effective technique Meskin would use often but it is not typically used by Simon and Kirby so Mort probably picked it up elsewhere. This is a good example of a story page in that it shows many of traits of Mort Meskin during this period. The most obvious feature is Mort’s great handling of the action. 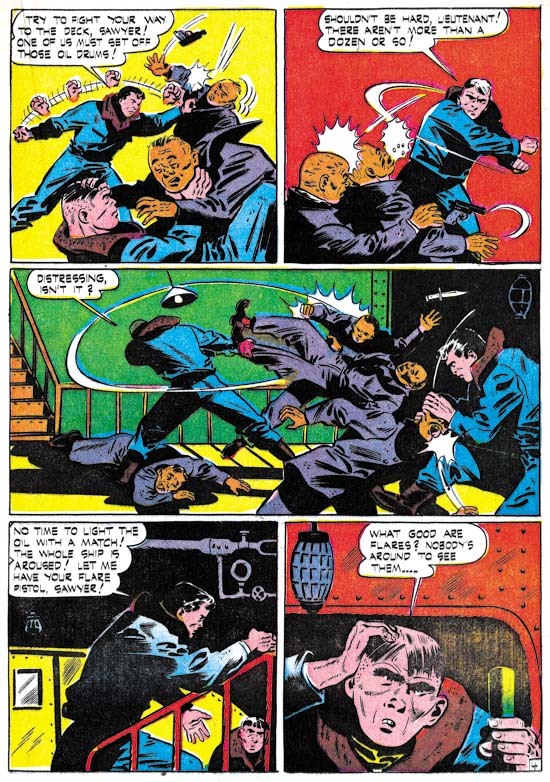 While he may, or may not have, drawn inspiration from Kirby’s slugfest, Mort’s handling of the fight scene is very different from Jack’s. Another technique that stands out is his use of circular panels. Again this could have been derived from Simon and Kirby but Meskin’s circular panels are very different. While Simon and Kirby’s circular panels would typically expand as far as the space allowed leaving isolated corner pieces, Meskin’s circular panels are usually smaller and fully embedded in the rectangular panel. There are also several examples of faces cropped by the edge of the panels (panel 4 and most noticeably the last panel). Mort makes effective use of this device. 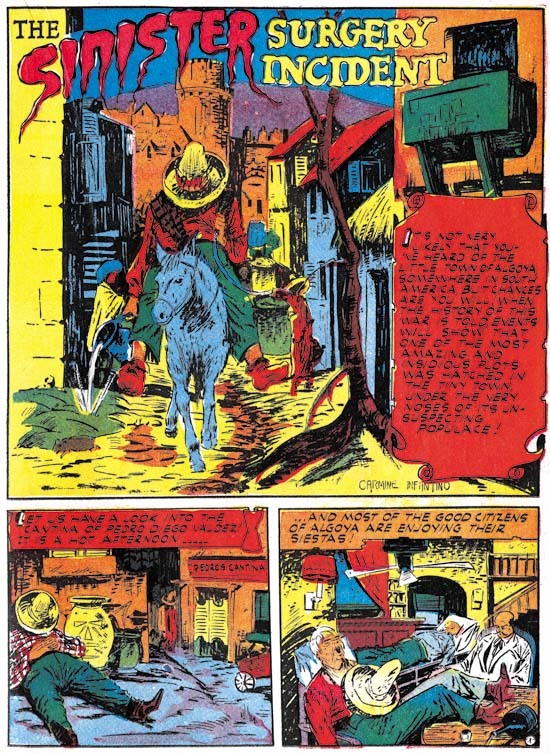 In fact the use of shifting view points and viewing distance, the cinematic effects, play an important part of Mort’s comic book art from this period on. I really do not know enough about Mort’s early DC work to say whether he was doing his own inking or not. It certainly was not inked in the manner typically used in Mort’s Simon and Kirby work. Some of his later DC work has dual signatures which indicate that in at least these cases another artist did the inking. Perhaps the most commonly used and most talented of these inkers was George Roussos. It is obvious from work that Roussos later did for Simon and Kirby that his own art was very much influenced by Meskin. 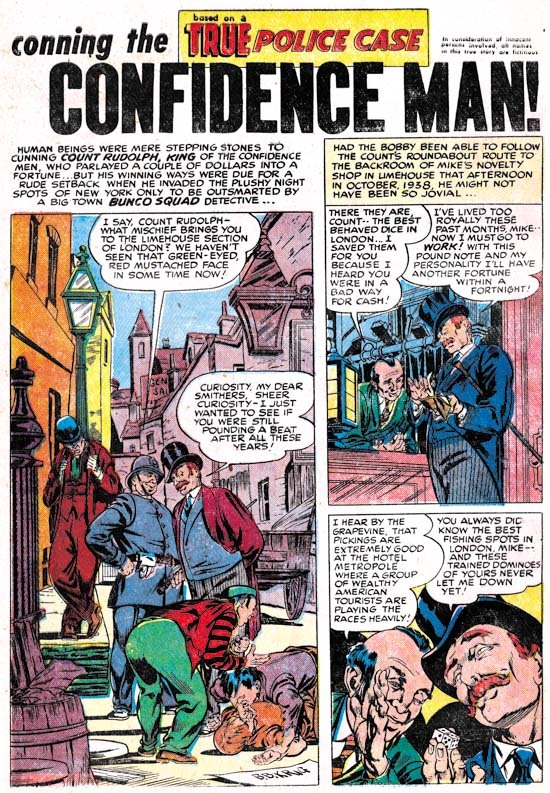 The Vigilante was not the only regular feature that Mort Meskin did for DC comics. He also drew Johnny Quick which appeared in Adventure and More Fun Comics. Much has been made of the fact that Meskin was the first to provide multiple images to indicate fast action. Previously only speed lines were provided to suggest rapid movements. While I would not want to diminish this technical innovation by Mort, his manipulation of view points and viewing distance were much more significant. For “The Jest of Jason Biltwell” Meskin was inked by Cliff Young. Mort Meskin would also occasionally pencil other stories. 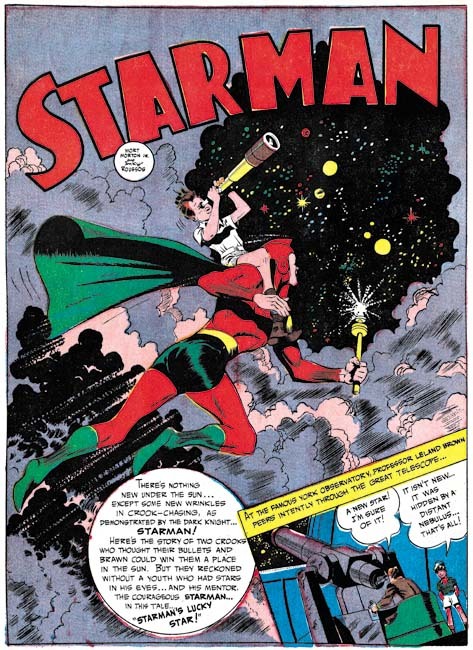 For example Mort drew a couple of Starman stories for Adventure Comics. I had previously provided an image from the Starman splash from Adventures #82 and now I provide an image from Adventure #81 above. My original plan was to write about Mort Meskin’s pre-Simon and Kirby work in a single post. Since I do not have enough examples to provide a more thorough examination of Meskin’s early art, one post should have been sufficient. However I must admit I was seduced by Meskin’s DC splashes and could not resist including a number of examples. I do prefer his graphic story telling for Simon and Kirby productions but Mort did not use full page splashes during that period. The closest that Mort came to these early splashes where some covers he did for Young Brides and Young Love in 1954 and 1955. Those covers are really nice and some are pure masterpieces of comic book art, but the earlier splashes provide a side of Meskin that I have seen no place else. So I extend my coverage and conclude it next week with a brief survey of Mort Meskin’s work that he did after the war. I will also be providing a few examples by Jerry Robinson as well. Today is Joe Simon’s birthday, he is now 95 years old. My original plans were to get a picture of Joe on his birthday and post it late today. However when I talked to Joe he remarked that he had told his family he wanted nothing special to happen on his birthday; no party or unexpected visitors. So I decided that taking a picture during my visit might not be a good idea. So in substitution here is Joe with one of his creations taken at the New York Comic Con in 2005. The French company, Organic Comix, has released a translated reprint of “Come into My Parlor” which was first published in Adventures of the Fly #1 (August 1959). This reprint was originally meant to be released earlier under a license agreement with Archie Comics. 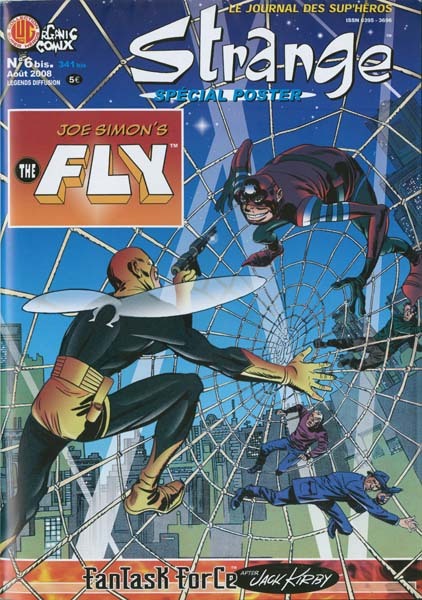 The only problem was Archie Comics did not have the copyrights for the Fly, those belong to Joe Simon. I am not sure why such a mistake had been made since Michael Silberkleit, then chairman and publisher of Archie Comics, had previously signed an agreement acknowledging Joe’s copyright renewal of the Fly. Whatever the reasons for the error, it was straightened out and Joe gave permission for the publication of Strange #6 with some minor alterations to indicate his ownership. There even was a friendly meeting between Silberkleit and Simon during the New York Comic Con. Unfortunately Silberkleit passed away recently (August 8, 2008). The format for Strange #6 is rather unusual; it was published as a single folded sheet. 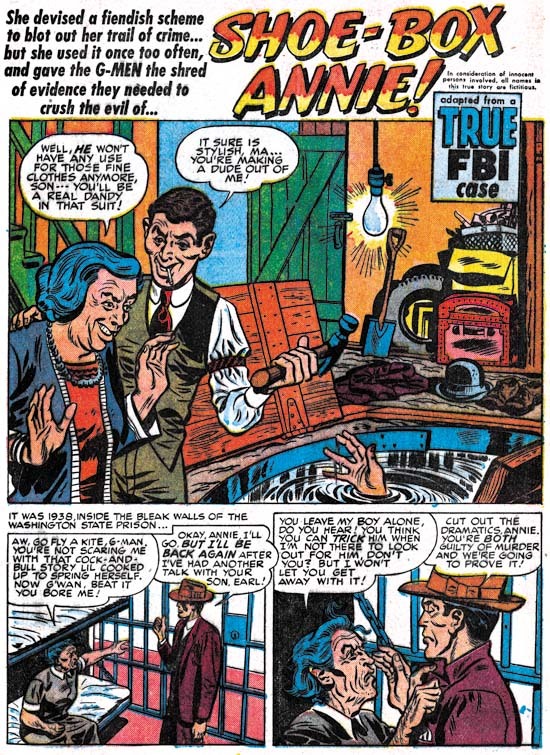 The comic unfolds nicely to allow reading of the Fly story, but when completely unfolded the backside reveals a large poster of a Kirby female costumed character. Frankly I am not familiar with this presumed superhero. I suspect it was one of the proposals Jack made late in his life. I would include an image, but the poster is much too large to be scanned. Harvey comics had a long history of reprinting stories. 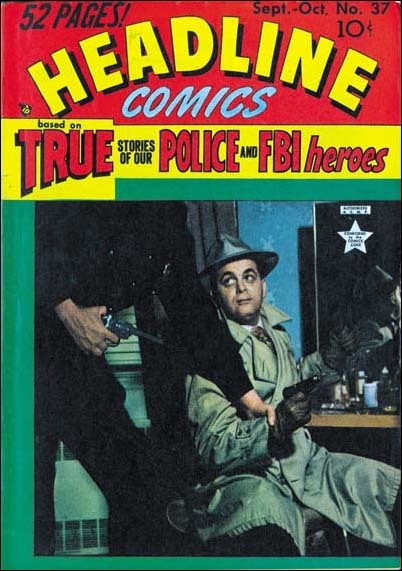 According to Joe Simon, any comic that included previously published material was supposed to be labeled as such but that Harvey generally ignored that restriction. At the time comic book readers typically lasted on a few years before giving up comics. Use older material and it was unlikely that many would notice. However when the Comic Code arrived, Harvey Comics had a problem. There was nothing in the code against reprints, but the Code was stringent enough that older stories were unlikely to pass unless edited. I have previously provided an example of such editing (Rewrite!) although at the time I did not fully understand why it was done. I have not found a copy of it yet, I am sure the story that I had posted about, Gangster’s Girl, was originally published before the Comic Code. The editing used to produce “Remember, I’m Your Girl” from “Gangster’s Girl” was relatively seamless. Despite the extensive editing involved, nothing obvious in the final story betrayed its reworked status. The handwriting was found on the margins of the original art looks like Joe Simon’s and so it likely Joe retrofitted “Remember, I’m Your Girl” for post-Comic Code publication. I have recently come across another example of editing done to reprint an older story for Comic Code approval. But in this case the final result was anything but seamless. 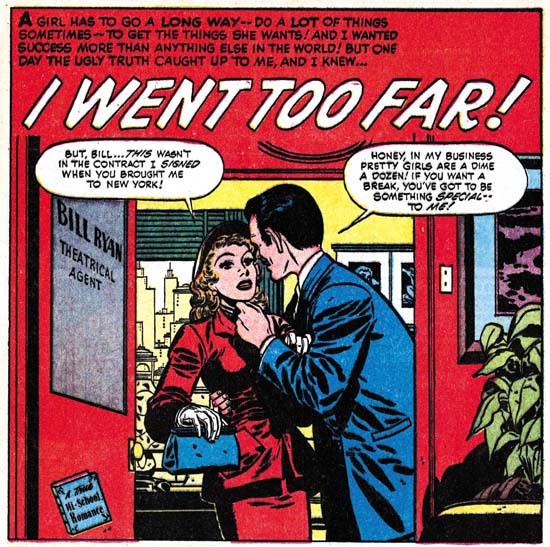 “I Went Too Far” from Hi-School Romance #19 (February 1953) was not that unusual for Harvey Comics. Harvey romances at that time were a little bit more risque then those produced Simon and Kirby for Prize Comics. By today’s standards they were still pretty tame stuff. Even then a youngster could see similar “adult” themes in the movies. When the Comic Code was introduced (the stamp started to appear on comics with cover dates about February 1955) what was suitable for a comic book reader underwent severe limitations. So when Harvey decided to reprint “I Went Too Far” changes had to be made. That changes had to be made is not at all surprising, but how they were made certainly was. The final results must have been the most poorly reworked story in the history of comics. If not I shudder to think what the worst one looked like. 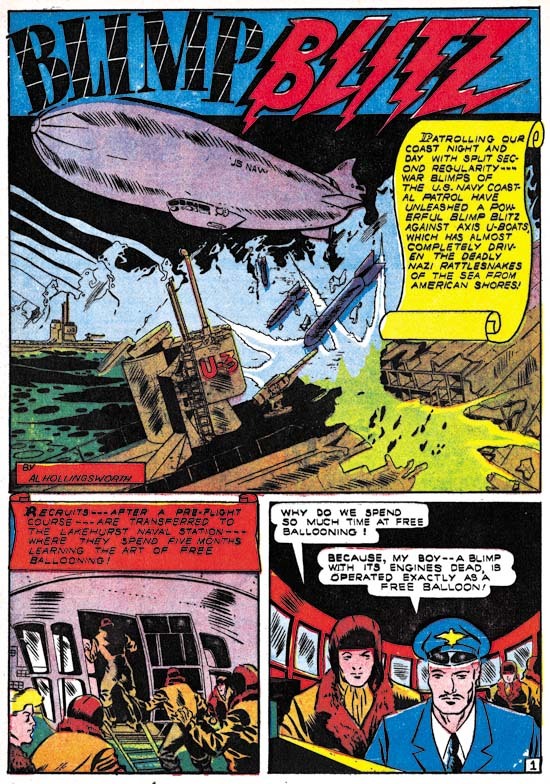 The problem faced by “I Went Too Far” under the Comic Code started with its title and theme. The whole suggestion underlying going too far was strictly taboo. Not that “I Went Too Far” truly went too far. There was nothing truly explicit presented but the protagonist Jennie was involved with men whose ulterior motives clearly extended beyond just aiding her career. Removing traces of the theme throughout the story would require significant editing, but the changing of “Gangster’s Girl” into “Remember, I’m Your Girl” showed it could be done. To start with a new title had to be used and “Broadway Lights” was a good beginning. However the caption that accompanied the title and the script in the speech balloons of the splash would never get Comic Code approval. Right away it can be seen why “Broadway Lights” would be such a disaster. Rather then come up with some new, more innocuous text, the editor simply discarded all the offending writings. That was bad enough but when combined a decision to keep the original color plates it would only highlight that something had been done. Areas could be removed from the color plates, but colors could not added. So the top of the splash page became emptied of all color. Just about any pre-Code romance story had art that needed to be changed in order to get approval. For instance any prominent display of the female figure, even when clothed, had to be adjusted. Normally this was done by judicious application of ink to shadow the offending art. This was also done in “Broadway Lights” and was the most successful of the editing changes done on that story. 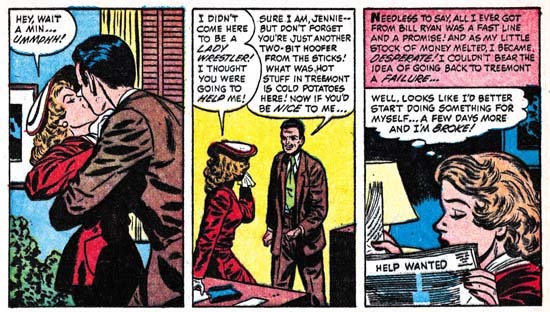 The Comic Code would never approve of Jennie showing her leg during an audition in “I Went Too Far”, so the leg was just shadowed in panel 4 above. Yes it left her in an inexplicable pose, but only the more observant reader would have noticed. Similar, relatively minor, additions of ink can be found throughout “Broadway Lights”. But changes to the art were not all that needed to be done in panel 4 as the manager request for Jennie to show he leg had to be removed. Also the description of Mr. Tindal’s importance in panel 5 was obviously considered too explicit. These panels highlight another shortcoming of the editing done. It was bad enough that a shorter text was to be substituted for the manager’s speech in panel 4; no effort was made to center it in the balloon. The editing to the speech balloon in panel 5 required just the removal of previous text, but since no attempt was made to center the remaining speech the balloon looks ridiculously spacious. As bad as the examples were of poorly edited speech balloons that I provided above, take a gander at panel 2 from page 3. Could the editor have made it any clearer to the original readers that they were getting damaged goods? In panel one Jennie’s remark was completely eliminated but the color plates left behind a trace of the original balloon like some sort of ghost. The primary reason of all this editing was the need to remove any reference to the agent offering Jennie a check for a train ticket! The editor felt that it would be okay under the Comic Code to offer a business card but not any money! Unfortunately in all likelihood the editor was probably right. Note also the editor felt that agent’s running his fingers through Jennie’s hair was also objectionable and so his fingers get the shadow inking treatment. Most of the art changes made were done with covering over areas with black. One exception was the first panel of the last page. The original version showed Jennie’s man, Roy Tindal, packing a suitcase. This was probably the most explicit indication of the extent of the relationship between Jennnie and Roy. It was probably too subtle for most of the story’s readers to understand, but not subtle enough for the Comic Code. The suitcase was redrawn as a set of drawers or a filing cabinet. It is hard to be sure which, but that was enough. Since the color plates were not altered, this art modification left an inexplicable red patch on the side of the bureau. In order to remove the “went too far” theme anything remotely suggesting the trading of sexual favors by Jennie in order to advance her career had to be eliminated. Actually there was little to suggest that in the original “I Went Too Far” but there were two stolen kisses. Jennie’s reaction to the first showed it clearly was unwelcome but that did not matter it still had to go. A little shadow to a kiss scene would not hide the kiss, so more drastic measures had to be done. 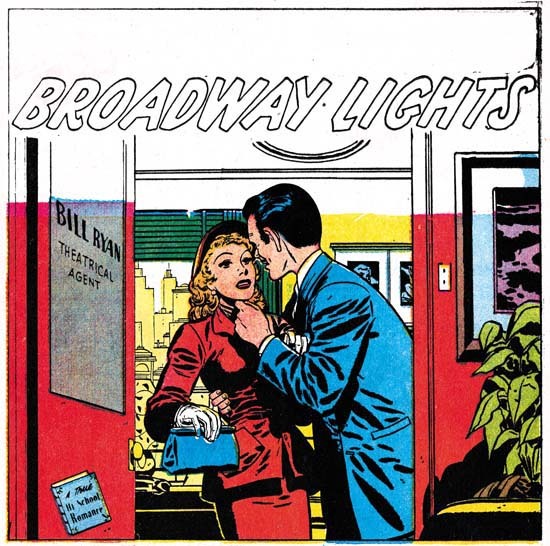 The logical approach would have been to have some artist provide a new panel, but obviously little in the way of artist’s fees were going to be added to the costs of updating “Broadway Lights” to the Comic Code. Instead the editor toke a copy of the line art from panel 2 enlarged it slightly and used it to replace the kiss in the first panel. Naturally the color for panel 1 was no longer appropriate so all color was removed. The results are glaringly unnatural. While inking in a little shadow would not hide a kiss, inking in a lot would. Completely filling in the panel was the editor’s solution for the other stolen kiss. This drastic solution for modifying art was used in another panel as well. I do not know what I find most egregious; duplicating art or completely removing it. I have by no means pointed out all the changes made to this story in order to get it approved by the Comic Code Authority. Every single page had multiple examples of glaring obvious changes of very heavy handed editing. I am sure even the most unsophisticated original comic book owner must have known that they were reading reworked material. That reader must have been confused by the ending because while Jennie’s former small town boyfriend comes to the rescue, the scenes where he punches out Roy Tindle and the one where the cops lead Tindle away have been inked out. While in the original ending Jennie’s attempt to renew her relationship with her rescuer fails as he reveals he is to be married the next day, for the rework version the relationship is repaired. Frankly the “I Went Too Far” version really did not go too far. Nothing was explicit or beyond what might been seen in the movies of that day. None of Jennie’s actions were at all glamorized. The story was a true morality tale with Jennie’s ill made choices resulting in her loosing everything she previously had while gaining her preciously little. The Comic Code “Broadway Lights” version completely looses the moral message because despite some of her errors Jennie looses nothing of significance. 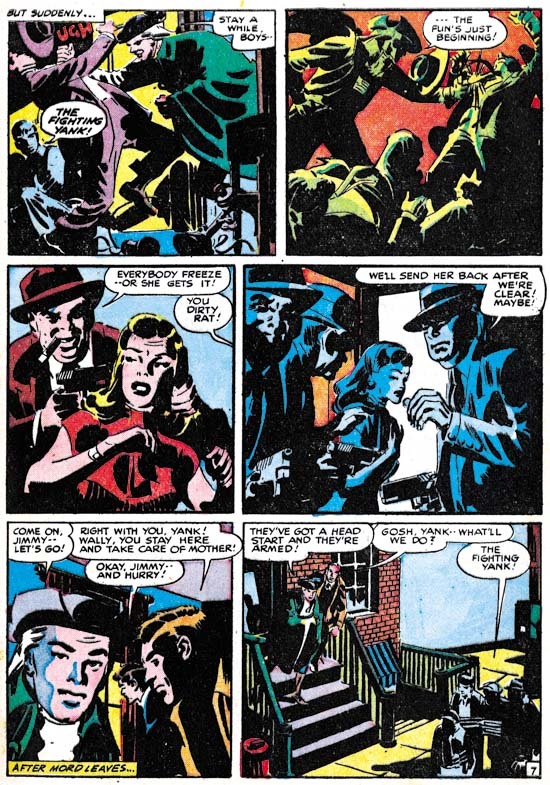 Ironically the Simon & Kirby studio regular, Bill Draut, was the artist for both the more kindly editing of “Gangster’s Girl” to “Remember, I’m Your Girl” and well as the horrendous job of transforming “I Went Too Far” into “Broadway Lights”. In neither case would the reprinting of the stories have been of any concern of Draut as he almost certainly did not get any reprint fees. 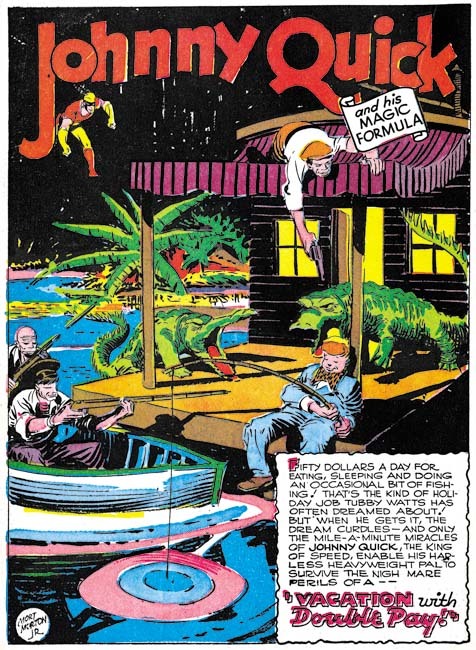 Joe Simon once remarked to me that Harvey had used the left over material from Stuntman and Boy Explorers without any permission from Simon and Kirby. As Joe put it, in the comic book business even a friend would take advantage you. Leonard Starr began his career in 1942 and 1943 doing background art while attending Pratt Art Institute. 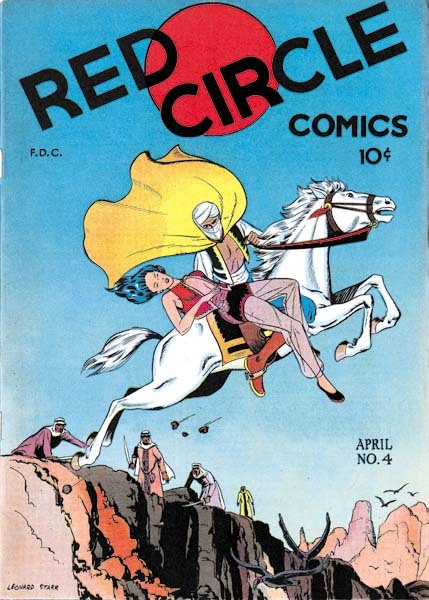 Afterwards his worked for a variety of comics including Red Circle published by Rural Home Publishing. 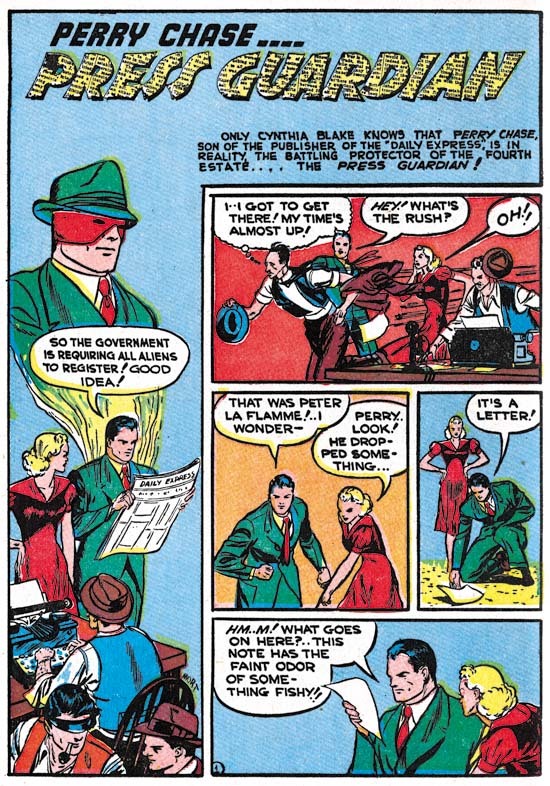 Red Circle #3 was released in 1945, just four years before Starr’s appearance in Simon and Kirby productions (April 1949). What a difference a few years can make. While I can detect some familiar features in Starr’s earlier art, I doubt I would have identified any of it if the signatures had been absent. 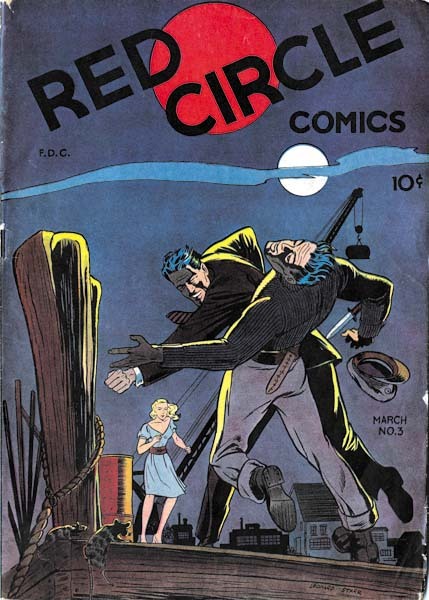 A fight scene dominates the cover for Red Circle #3. A brave man wins with his bare hands against a knife carrying opponent. An exciting cover that is excellently drawn. However in my opinion, a good cover should tell a story. Part of the story is here. The man on the wrong end of the fist had, as indicated by his hat, a maritime profession. This is fitting as the mooring ropes and rats show the locale to be some seedy port. But what is the cause of the conflict? Is it the woman who looks on? She shows an interest but no fear, so a heroic rescue is unlikely. So what does it all means? The art is well done but the story is confusing. Unfortunately the cover has nothing to do with the contents of the comic, so we will find no answer to the question. Starr and Bolle provide a better job for the splash of “Secret Assignment”. Anthony Cobat literally casts his shadow over the globe; he is an agent in a fight against international crime. 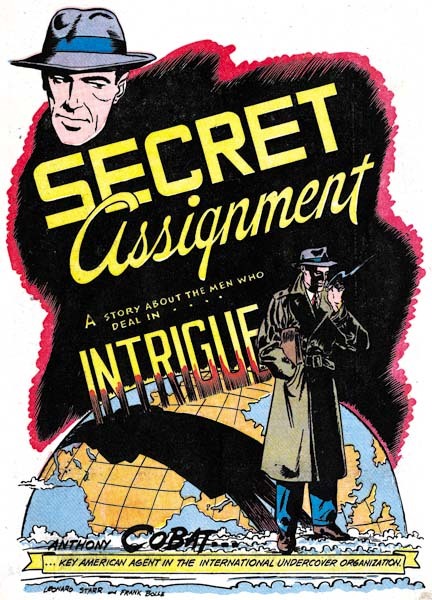 With a briefcase under his arm, a nondescript overcoat and his face shadowed, the image of Cobat is derived from Hollywood; the use of “intrigue” in the title is superfluous. Starr and Bolle also did a great job in the story. Their playing off of fore and backgrounds is well done. For example, the man in the stripped green jacket in the foreground is pointed out as an agent by one of the two men in the background in panel 3. In Panel 4 the foreground is dominated by a pair of gloved hands. These hands could have mistakenly been attributed to some woman except just enough of a sleeve is left to show the same green with stripes. Of course the caption also identifies the owner of the gloves and indicates that there was purpose behind the simple act of putting on gloves. My only complaint to offer about this page can probably be laid at the writer and it is an all too common error. 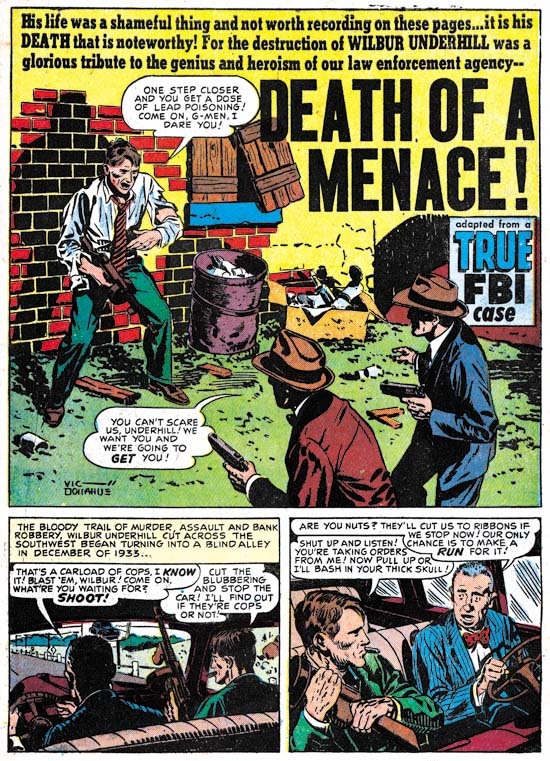 There was really no reason to add the caption “ANOTHER AGENT RAISES HIS GUN” to panel 5, the picture was sufficient and would have been more effective without the caption. Panels without captions or word balloons were rare exceptions during the golden age of comics. “Secret Assignment” was jointly signed by Leonard Starr and Frank Bolle. Bolle is an artist just a little older then Starr. Like Starr, Bolle’s career has included both comic book and syndication strip work. Since his name follows Leonard’s, Frank may have been the inker. But we have seen that such an interpretation maybe over simplistic for some teams such as Robinson and Meskin, or, for that matter, Simon and Kirby. 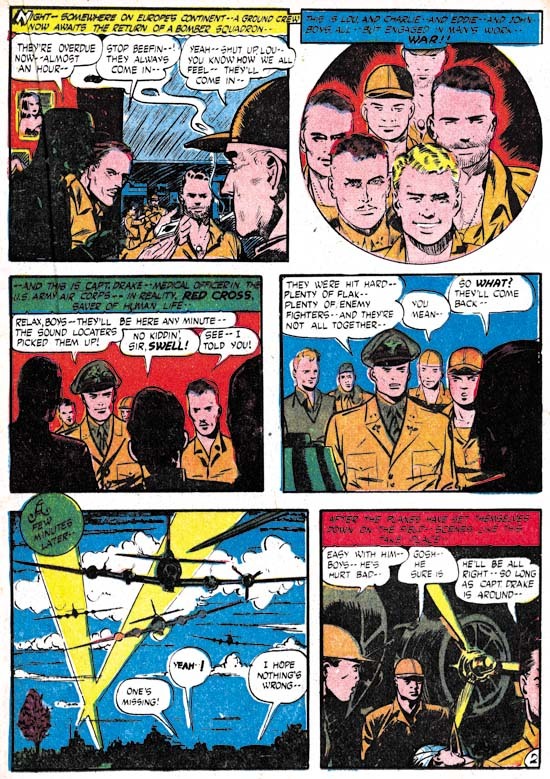 For work that Starr did for Simon and Kirby, he showed a preference for a page layout with one or two rows consisting of three, vertically extended, panels. That type of page layout is not found in “Secret Assignment”. However a related layout can be found; one where a panel row is unequally divided into three panels one of which assumes a narrow shape. 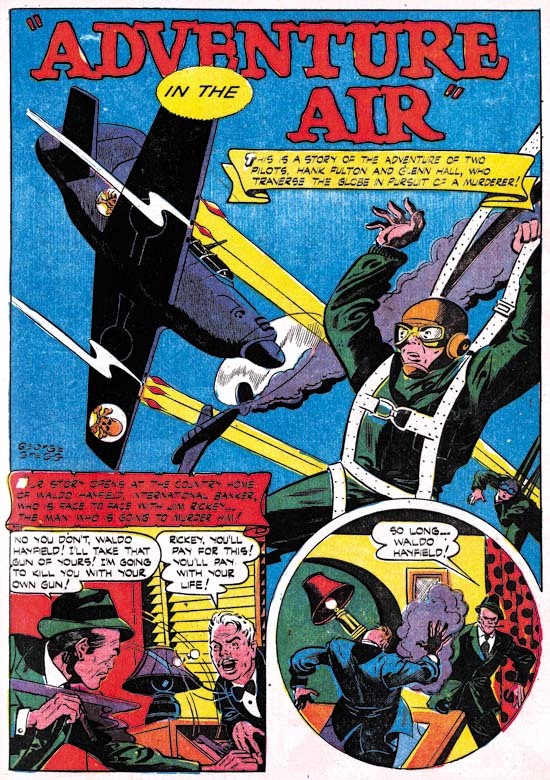 The effective use of this narrow panel may have made it a forerunner of the vertically extended panels found in Starr’s Simon and Kirby work. Another nicely drawn cover by Starr with, once again, a confusing story. The woman being carried away seems limp so very likely she has fainted. It is an abduction perhaps from the men in the background who are unable to pursue. A jump over some gorge might be indicated but the vultures flying below suggest a cliff instead. Was the horse magical or was there an unseen but safe landing? Who can tell? 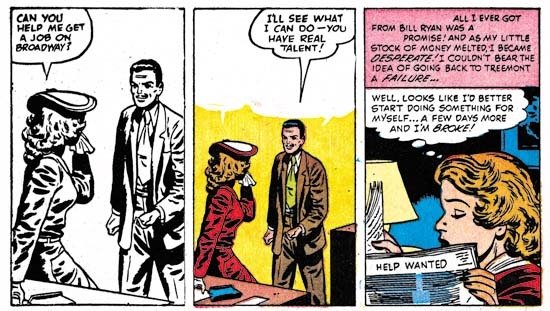 Of all the art the woman’s face is the closest to the style Starr would use later for Simon and Kirby. It would be great to be able to show an image for the story Starr provided inside of Red Circle #4 but I am unable to do so. The interior of my copy is filled with Dorothy Lamour stories. If that was not bad enough, the first one does not even have the splash page. None of this matches what the contents of this issue should be. It looks like a Frankenstein; a combination of the Red Circle #4 cover with an old Dorothy Lamour contents. There is no sign of trimming so I believe this was done years ago. I have heard of publishers who repackaged material for resale, but this seems like an egregious example of that practice. 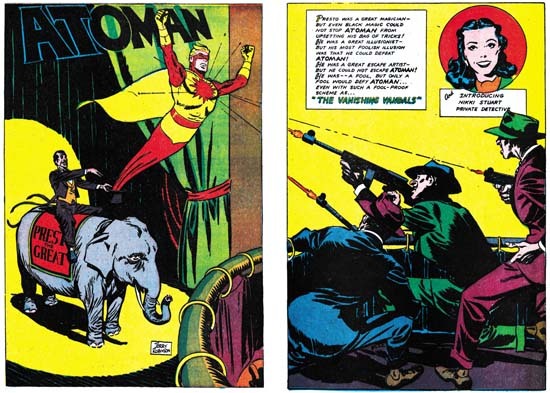 According to the GCD, Fox Comics published a couple of issues of a Dorothy Lamour comic in 1950, but the story titles that GCD provides do not match those in my comic.